Emre İper, who works as a finance manager at the Cumhuriyet daily, has been detained over use of a smart phone application known as ByLock. İper was detained in the early hours of Friday following a police raid on his house. 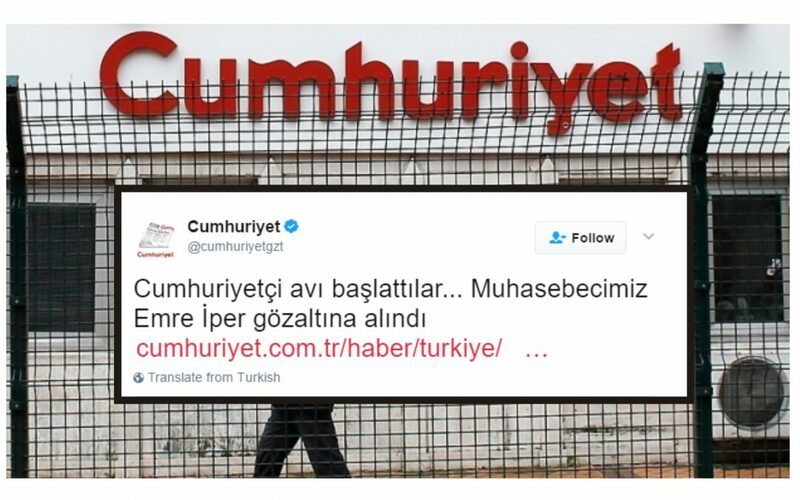 The Cumhuriyet daily has been the target of a government-led crackdown on critical media outlets in the country recently as 10 journalists and executives from the daily, including its Editor-in-Chief Murat Sabuncu, were arrested by the İstanbul 9th Penal Court of Peace in November. They face allegations of aiding the terrorist Kurdistan Workers’ Party (PKK), far-left Revolutionary People’s Liberation Party/Front (DHKP/C) and FETÖ. “FETÖ” is a derogatory term and acronym for the “Fethullahist Terrorist Organization,” coined by President Recep Tayyip Erdoğan and the Justice and Development Party (AKP) government to refer to the Gülen movement.